You can't hold these guys down forever. The first three games of the NBA Finals were rough for the Splash Brothers, despite the Warriors being up 2-1 heading into Game 4. Klay Thompson was averaging 12 points on 12.7 shots while shooting 36.8 percent from the field and 30 percent from deep. 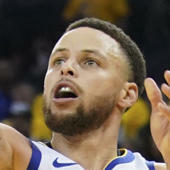 Stephen Curry was averaging 16 points on 13 shots while shooting 43.6 percent from the field and 40 percent from downtown. For Curry, those aren't bad shooting numbers but they're below the insane standards he has set for himself the past two seasons. Factor in the lack of scoring volume for the league's unanimous MVP and scoring title holder, and it just didn't seem like enough production from the new face of the NBA. The Cleveland Cavaliers were holding the Golden State Warriors' superstar to sub-optimal performances for him by being physical off the ball and hounding him wherever he went. For Thompson, it wasn't anything close to what we've seen from him this season or this postseason. He went from keeping the Warriors' offense going while Steph was out with his MCL sprain to looking like an afterthought on offense. The Cavs' wing defenders denied him the ball and took away the comfort and rhythm of open looks within the flow of the offense. All of that changed in the pivotal Game 4 in Cleveland. Curry exploded for 38 points on 11 of 25 from the field. He hit more 3-pointers (seven in 13 attempts) than the entire Cavs team did all night (six in 25 attempts). Thompson flanked him perfectly, dropping 25 points on 7 of 14 from the field and 4 of 9 from deep. The Splash Brothers had defrosted the frozen pond quite nicely and set themselves up for a great chance at a second straight championship. So how did they return to form to all but bury the chances of LeBron James in year two of his return to Cleveland? They got back to their old, dominant ways. With the way opponents typically worry about Curry court and then have to scramble when it's Draymond Green working with the ball as the defense scrambles back into position, Thompson ends up benefiting from a lot of great open looks. Considering he may end up being the second-greatest outside shooter of all time when his career is over, it's crazy to think he ever gets an open look. But that's what happened quite often in Game 4. The most egregious example of Thompson getting open was on a 1-2 pick-and-pop he ran with Curry. Klay sets the screen for Steph, and most defenses will try to swarm Curry with both defenders in the pick play to either cause a turnover or a pass that hangs in the air long enough for the defense to rotate. That didn't happen here. Kyrie Irving and J.R. Smith trapped (poorly, I might add) Curry as Thompson popped to the right wing. The problem with this is the other three Cavs defenders were well below the free throw line and nobody was there to rotate to the next Ray Allen. Just a reminder: Klay Thompson is the 12th-most accurate 3-point shooter in NBA history and he's the only player in NBA history to hit over 1,000 3-pointers in his first five seasons. Not even Curry did that (905). After turning the ball over 38 times in Games 2 and 3, the Warriors took much better care of the ball and passed extremely well around the Cavs' defense. A couple of those possessions with superior passing put Cleveland in a tough position, where the Cavs had to make a choice of who to leave. Twice they left Thompson open and paid for it dearly. In this first play, Andre Iguodala got the ball on an entry pass from Curry into the middle of the lane. As the defense swarmed, he had two passing options with Smith stuck trying to defend both. Harrison Barnes was in the corner; Thompson was on the wing. Iguodala looked toward Barnes before delivering it to Thompson. Smith walked back up the court pretty dejected by his rotation decision. The second player saw a bullet entry pass from Draymond into Shaun Livingston in the restricted area. He wasn't in position to put up a shot, as the pass was a little too hot and took him out of scoring position. He swung around and kicked it to Iguodala. Channing Frye rotated over to Iguodala, but did so by failing to go on the high side of the Warriors' wing. Instead of having the extra pass angle taken away and forcing Iguodala baseline, it was an easy kick to Thompson for another 3-pointer. And then, of course, you have the upside-down world of trying to cover these two in transition. Normally, you're taught to retreat to the paint as a transition defender and then match up. That doesn't fly against the Warriors. You have to find the shooters on the perimeter first and if you get sucked into those transition defense tenets you've had hammered into your brain over the years, they usually burn you. On both of these transition 3-pointers, that's exactly what happened to the Cavs. It's hard to blame them because against any other team, that's what you're supposed to do. But then again, this isn't any other team. It wouldn't be a Splash Brothers game without Curry having a monster contribution too. With the way he played in Game 4, another performance like it in Game 5 will probably earn him his first Finals MVP trophy. Let's get the elephant in the room with the Warriors and creating space for Steph Curry out of the way first. Warriors center Andrew Bogut does a lot of screen-setting for Curry. Not all of the screens are technically that legal. But it's not correct to call out the illegal screens of the Warriors while ignoring that every team sets these for their top shooters. The Warriors just have the two top shooters in the league, so it seems more effective when they do it. There were two pretty egregious illegal screens in this game by Bogut. Both of them got Curry open for a 3-pointer and Curry delivered to complete the play. Bogut is subtle while also being obvious about it, which sounds contradictory and probably is. The first screen he set on Smith, he keeps his hands at his chest but moves in the way while grabbing J.R.'s jersey. The second one is against Irving. Bogut holds the arm, grabs the jersey, and keeps moving until Curry is free. Splash on both plays. Those were in the third quarter though and Curry was already in a rhythm at that point. We saw that rhythm by the typical step-back 3-pointer Curry often employs to hurt the defense and dazzle the crowd. The one he hit against Iman Shumpert toward the end of the first quarter was flat-out filthy. Curry went away from the screen and started driving into the middle of the floor. As his momentum got Shumpert leaning away from the 3-point line and off-balance, Curry reversed course and made his way behind the 3-point line before he let the shot fly. A subtle thing Curry does on these shots quite often is he takes an extra dribble before he shoots. Most guys will take that final dribble, pick it up, and then go into the step-back motion. It takes incredible balance (like Damian Lillard or Kemba Walker) to rise up composed and release a good shot. Curry's extra dribble comes in the process of the step-back footwork, which gives him supreme balance as he rises for the shot. With 3:35 left in the fourth quarter and the Warriors up seven points, Curry ran a pick-and-pop with Iguodala that got a switch they were dying to find. Irving went to Iguodala and Frye was stuck on Curry. It looked like Curry gave up on the play and just dished it off to Iguodala to go attack the defense. When this happened, Frye started moving away from Steph like there was going to be a switchback. The problem with this though is you're leaving Curry at all. He promptly got the ball back, side-stepped a poor closeout by Frye, and put the Warriors up 10. You can't make these dumb mistakes against Curry. There are moments in which Curry just unfairly fires off a quick release 3-pointer. He jacked one with 16 seconds left on the shot clock on Richard Jefferson before he knew what was hitting him and knocked it down cold. He recovered a loose ball in the left corner and fired off another quick attempt before Frye could help track him down. There's nothing you can do about those moments. This is death at your doorstep, kicking the door in. In Game 3, the Cavs locked up Curry by just never leaving him. They grabbed him. They held him. They kept him from moving freely. You could say they were fouling him, but this is typical off-ball defense. Curry didn't do much about it, didn't complain about the physical play, and said after the game that he needed to make more decisive moves to get free. He did a much better job of that in Game 4. He did his own physical play by getting a slight push to the defender to get away, and on this play late in the third quarter, it got him a backdoor layup. These are the types of plays he simply wasn't making before Friday night. And you shouldn't talk about how well Curry played without mentioning his playmaking for others. He found ways over and over to get the ball into the middle of the floor. Twice it was him breaking down Tristan Thompson, who did a great job on switches in Game 3. He either found Green underneath for a bucket or he kicked it to Iguodala for a corner 3-pointer. Or he whipped a pass into the paint to Thompson before the defense ever knew what hit them. Overall, these were the performances the Warriors probably needed in order to win in Cleveland. The game was closer than the final margin of 11 points. It may have been enough for the Warriors to break the spirit of the Cavs in this series. The pond isn't frozen anymore. The Splash Brothers are splashing again. And sometime in the next week, they could be celebrating their second straight title.